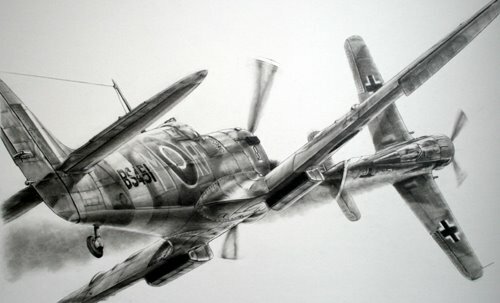 A recently complete piece completed by James Baldwin is this one, showing the Spitfire Mk. IX BS451 of No 303 (Polish) Squadron in combat with the notorious German Focke-Wulf Fw 190 on 17 August 1943. On that day, Flt/Sgt Chudek and used BS451 to startling effect when he downed two German fighters. The Focke-Wulf in the image is attempting the classic roll and dive that was this type’s trademark manoeuvre but on this occasion it was too late.